Definition at line 804 of file LoopInfo.h. Definition at line 813 of file LoopInfo.h. Definition at line 816 of file LoopInfo.h. 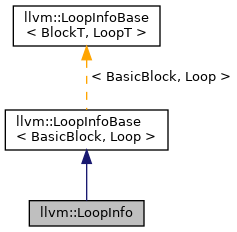 This updates the loop forest and parent loops for each block so that L is no longer referenced, but does not actually delete L immediately. The pointer will remain valid until this LoopInfo's memory is released. Definition at line 601 of file LoopInfo.cpp. References assert(), llvm::LoopBase< BasicBlock, Loop >::begin(), llvm::LoopBase< BlockT, LoopT >::begin(), llvm::LoopBase< BlockT, LoopT >::block_begin(), llvm::LoopBase< BlockT, LoopT >::block_end(), E, llvm::LoopBase< BlockT, LoopT >::empty(), llvm::LoopBase< BasicBlock, Loop >::end(), llvm::LoopBase< BlockT, LoopT >::end(), llvm::LoopBase< BlockT, LoopT >::getParentLoop(), I, llvm::LoopBase< BlockT, LoopT >::isInvalid(), llvm::make_scope_exit(), and llvm::LoopBase< BlockT, LoopT >::removeChildLoop(). Referenced by LoopFuser::fuseLoops(), getInnermostLoopFor(), INITIALIZE_PASS(), llvm::UnrollAndJamLoop(), and llvm::UnrollLoop(). Definition at line 592 of file LoopInfo.cpp. Return true if moving Inst to before NewLoc will break LCSSA, assuming that the function containing Inst and NewLoc is currently in LCSSA form. Definition at line 862 of file LoopInfo.h. References assert(), llvm::LoopBase< BlockT, LoopT >::contains(), llvm::dyn_cast(), llvm::Instruction::getFunction(), llvm::Instruction::getParent(), llvm::User::operands(), and llvm::Value::uses(). Definition at line 817 of file LoopInfo.h. Returns true if replacing From with To everywhere is guaranteed to preserve LCSSA form. Definition at line 836 of file LoopInfo.h. References llvm::LoopBase< BlockT, LoopT >::contains(), llvm::dyn_cast(), llvm::Instruction::getParent(), and I.
Referenced by ReplaceUsesOfWith(), llvm::simplifyLoopAfterUnroll(), simplifyLoopInst(), and simplifyOneLoop(). Definition at line 807 of file LoopInfo.h.